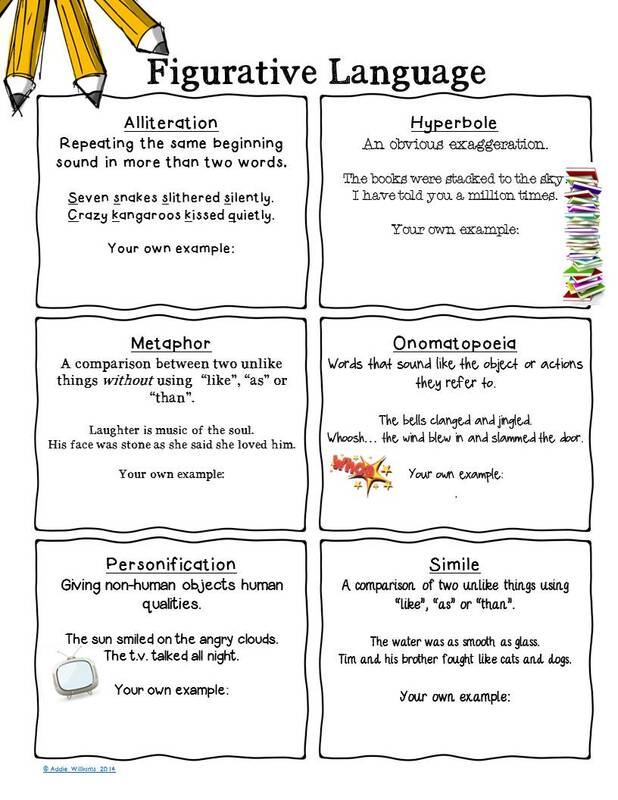 In honor of World Poetry Day on March 21st I thought I'd post a quick review activity for poetry terms / figurative language. You can use this worksheet as review for a quiz or as an introduction to poetry terms (just work on one term at a time). I often have the students work on their own examples and write them on the board at the front of the room. My students (I've done this with grades 8-12) love the chance to write on the board and share their poetry prowess with others. I usually have 4-5 whit eboard pens out at a time and once a student has written their example on the board, they must pass the pen to a new student. There's less pressure on the students if there's more than one person writing on the board at the same time, and they can write their ideas anonymously. I usually end up with a giant free-flowing board of really great examples and the kids love to read what others have come up with. Click on the image to grab a FREE copy of my Figurative Language Student Reference / Review Sheet! **Check out the ESOL Odyssey for a fun Linky Party for National Poetry Month. Lots of great FREE and paid products linked up. Free permission to pin, but (I) need to ask for permission to print. Hi Homeschoolingmom.... It's a free download, hosted on Googledocs, you don't need permission to print. Just save it to your computer as a PDF and then you can print it. Hi again Homeschoolingmom... just realized I'd made an error with the Google doc. So sorry that happened... you should be able to download it now with no issues. Thanks! Ok, good. I do have google doc. & it still didn't open. Glad you fixed it. Good for you Addie! You deserve it! Thanks for sharing! This will be a terrific resource as my sixers work through our poetry unit.